After getting rid of any HF equipment last year, I'm slowly putting together what can't really be called a HF station. 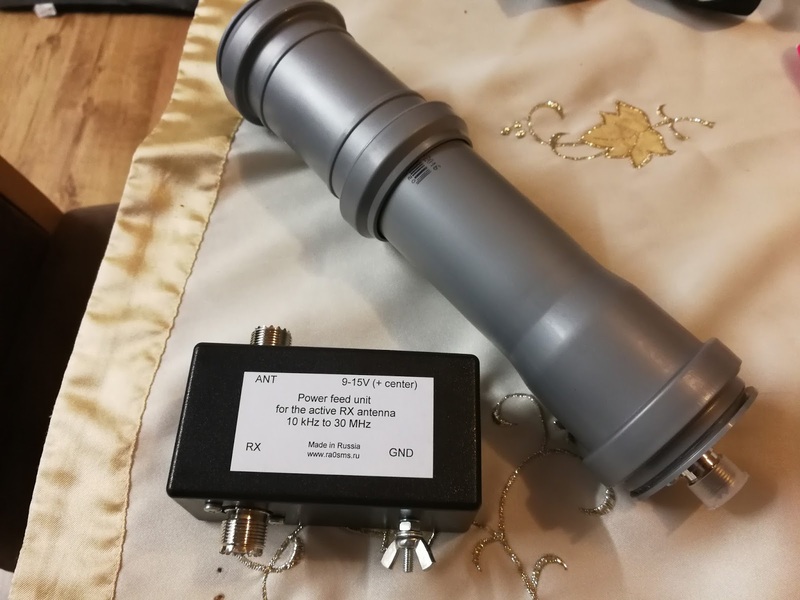 I got a WSPRLite to transmit WSPR with at a massive 200mW, and have been using that into a mobile antenna on the car. I thought it was time to get something to receive with, so bought one of the cheap HF software defined radios, based on the usual TV tuner devices. 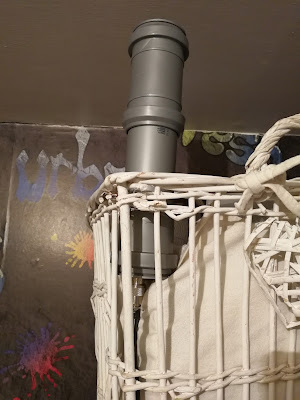 This has 2 SMA antenna sockets, one for below 30MHz and the other for above that. There is data/power through a Mini USB connector (just when you think nobody uses them any more). So a bit tidier than a TV tuner 'dongle'. On VHF/UHF, it seems about the same as a standard RTL TV tuner, using SDR# software. On HF and below is where it is a bit strange. I thought it might have some kind of up-converter to allow reception below 30MHz (they can tune to about 24MHz normally). No, it doesn't use any converter, you just select "Direct Sampling - Q Branch" in the settings (even if you aren't James Bond). But, as the sampling frequency is fixed at 28.8MHz in this mode, it can't receive anything above 14.4MHz. If there is a signal on 14.3MHz, it will also appear to be on 14.5MHz etc. Close to 14.4MHz there is a lot of noise from the 28.8MHz oscillator, so it doesn't really work on the 20m amateur band either. 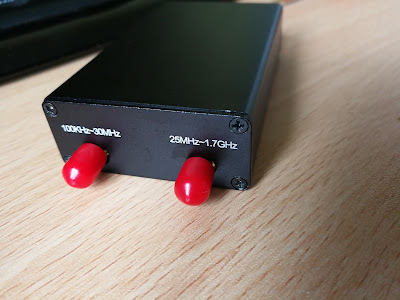 It does work OK below 10MHz, best on the 3.5 and 7MHz amateur bands and I've had it receiving WSPR on those once I worked out the frequency error (it's about 50ppm out - even at 3.5MHz that would be too much to leave uncorrected for WSPR). 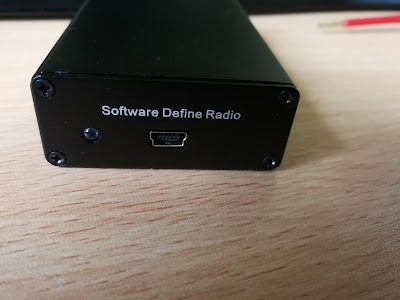 SDR tuners seem to be quite fussy about the power from the USB port - on my laptop this wouldn't work at all without being plugged into an external powered USB hub, and even the standard TV tuner dongle refused to work with a short USB extension cable. 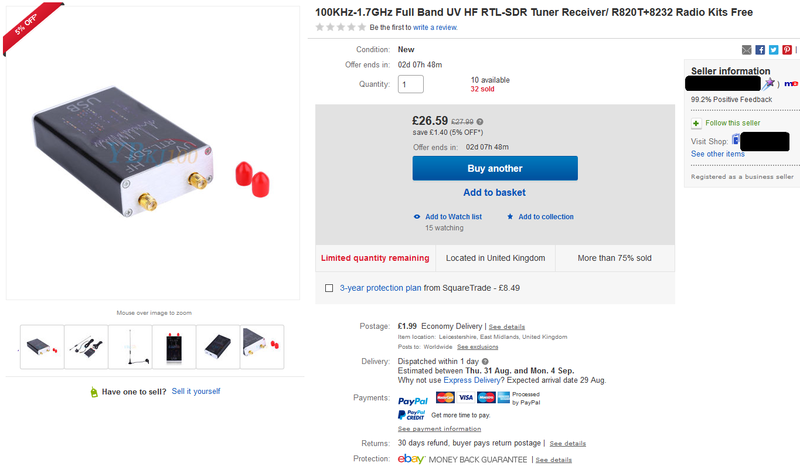 So if you're looking for something covering all HF bands, this isn't for you and you should spend a bit more on one of the better software defined receivers.